on June 1, 2017, 7:29 p.m.
President Donald Trump recently visited the Kingdom of Saudi Arabia as his first overseas visit in his current presidential term. More than half of Saudi residents (57%) believe Trump’s visit to the kingdom has had a positive impact on US Saudi ties and it will strengthen them going forward according to the latest YouGov Omnibus study. 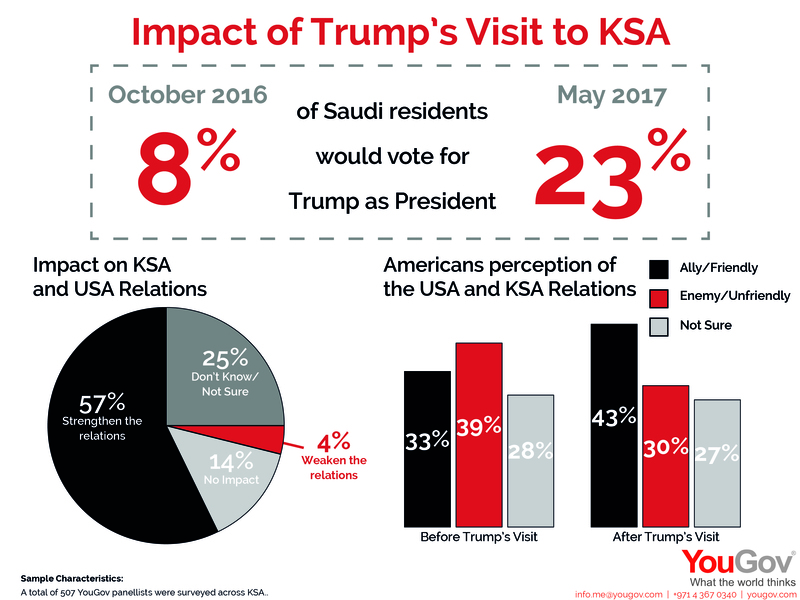 To better understand how this visit was perceived by residents of Saudi Arabia, global research firm YouGov ran a short online survey using their Omnibus Express service from the 25th to the 29th May 2017 amongst 507 Saudi residents, to gauge their opinion around Trump’s visit to their country. Most notably although over half of respondents claimed that Trump’s visit hadn’t changed their impression of him, it seems to have had a large impact on his candidacy as US president; when given the choice now to vote between Trump and Clinton as US president 23% of Saudi residents would vote Trump compared to 22% for Clinton, signalling a huge jump for Trump from a previous YouGov Omnibus poll run in conjunction with Arab News before the US elections in October 2016, where Trump received just 8% compared to 41% for Hilary Clinton in Saudi Arabia. Overall, around one quarter of residents of Saudi Arabia questioned by YouGov said the visit positively affected their impression of Trump, compared to 38 percent who said the visit made no difference. Only 10 percent said the visit had a negative impact on their impression of Trump, while 29 percent said they did not know or were not sure. Commenting on the findings, Faisal J. Abbas, editor in chief of Arab News, said: "The results prove what we always have argued, that in politics actions speak louder than words. Whilst Mr. Trump had a bumpy ride with public opinion during the campaign period, his actions - when it comes to the Middle East - have been nothing short of being incredibly spot on, particularly when he took immediate action when the Syrian regime used chemical weapons." "The excellent speech President Trump gave in Riyadh at the Arab-Islamic-American summit - where he spoke of partnership, of a joint enemy in terrorism that threatens everyone, and his statement that the US is not there to dictate a way of life, but to offer a helping hand - has done a lot to boost his image in the region to the extent that people barely remember his pre-election rhetoric." Kailash Nagdev, managing director for YouGov in the Middle East and North Africa, agreed that the presidential visit had given a clear boost to public opinion about Trump in Saudi Arabia. Nagdev pointed to a previous Economist/YouGov poll, conducted last week among US residents, which found that 44 percent of Americans consider Saudi Arabia an “ally” or “friendly” toward the US, an improvement on the same Omnibus study conducted two weeks prior to Trump’s visit. Whilst one third of respondents were generally undecided as to what was the most important announcement made during Trump’s visit, the economic and arms deals struck by both governments topped the list with the $110 billion US Saudi arms deal ranking most important to 21% of those polled, followed by $55 billion worth of deals signed by US and Saudi companies to diversify the economy. “Given the economic diversification agenda related to Saudi Vision 2030, US support to these initiatives is considered important. Hence, it is not surprising that the announcements related to the economy were considered most important by 39 percent of residents. Whilst the announcements related to terrorism and on warning to Iran were rated high by 26 percent of residents,” said Nagdev.